A couple of years ago, I bought a little Canon photo scanner, and I've had a pile of acid-free photo albums for years--all untouched. I cannot figure out how to find the time, or to organize, this project, and yet it breaks my heart to see the past fade away, and people forgotten. REDS, do you keep old photos? (You all seem to have handy photos to post.) How do you manage to do it? And then there's the thought--now we are all digital, which I guess is better. But is it sad that we are leaving no physical record of our lives NOW? HALLIE EPHRON: Fortunately for me my husband is diligent about printing photographs every so often and putting them in an album. When our library got a wonderfully fast scanner, he spent hours and hours in there scanning our old photographs and so we have most of the 'keepers' online (in Dropbox) as well. Digital is easier to share, and it makes a great Christmas gift to send a relative a carefully culled collection of old photos on a flash drive. HANK PHILLIPPI RYAN: Can Jerry come to our house? Our photos are tragic. In boxes, and some in a few albums, totally inaccessible. Luckily I have a family photo gallery on the third floor hallway wall, and there are many on display, and I have three old albums--at least I know where they are. I do love actual photo-photos--they seem more real somehow, and I love how you can date them by the scalloped edges, or the fading color, or the weight of the paper. (How do people look completely different now?) Yes, digital is great, although now we have thousands of photos of every darn thing. And every event. ("Where's that?" I'll wonder. Luckily the phone tells me.). And it's fun to flip through a family album. Sitting in front of a computer together is just not the same. 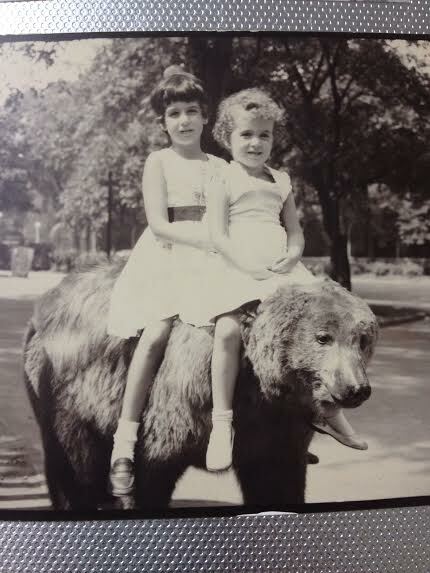 This is a photo of me with my little sister Nina at the Lincoln Park Zoo--circa 1954. Someday, that will someone's old family photo. It makes me think--I should label the back. LUCY BURDETTE: Oh gosh, we are desperately in need of Jerry too. I was looking at the boxes of loose photos in the bottom of my closet this weekend but like Debs, it feels like an overwhelming project. I have a small wedding album, and an album my mother made of me as a baby with cute captions, and a family album my father and I put together. But there are hundreds more--and yes, I too am the keeper of many slides, and old reel movies from growing up--the kind that jerk around and make you dizzy to watch. And we have a video of our wedding, which I know is disintegrating. DEBS: You all were SO DARNED CUTE!!!! Hallie, we need Jerry, too! Do you think he would come to Texas if we promised barbecue and tacos? Or margaritas? Hank, yes, so interesting. Why do people look completely different now? I have a framed photo in my hall of my daughter at the same age as me in the photo above, and the whole feel is so different. And Lucy, for my daughter's last birthday I had all her childhood home videos put on DVD. It was hours and hours of stuff I can't even remember taking! And I don't even want to tell you how expensive it was. Shocking. But at least I can think I saved something for posterity. PS Here's a bonus, one of the photos I found when I was looking for one for the grandmother post. This is my Nanny, holding a photo of me she's just unwrapped at Christmas. I'm guessing this was 1978, just before I left for Scotland to get married. And Rick had taken that photo as a going away present for me. Life is really weird sometimes, isn't it? I love photographs . . . and, although digital is much easier to share and to store, I can’t imagine not having real photographs. There just something about framed pictures gracing the walls . . . . But I have to admit having digital photographs does lend itself to zipping them off to Shutterfly or Snapfish or some such place and getting a photo book made. It’s really quite amazing and the grandchildren all seem to love having their own special family books . . . . It's a story old as time, apparently. I have a large collection of actual photos that need to get labeled and duplicated, but my mother has three times as many as I do. And I've been taking digital photos on several different devices, since 1999. Good grief. Someone at Malice was telling me that an updated version of the Polaroid system is coming back. So we will continue to have these issues, I guess. Deborah, I love the photo of your grandmother holding the photo of you--and you were able to share because of digital technology. I've gone through my photos (over the years) and scanned the most important ones--the ones that tell a story--like all the other wonderful photos shared here today. I posted some photos my sister had me scan of a trip she took to my grandparents' house once. 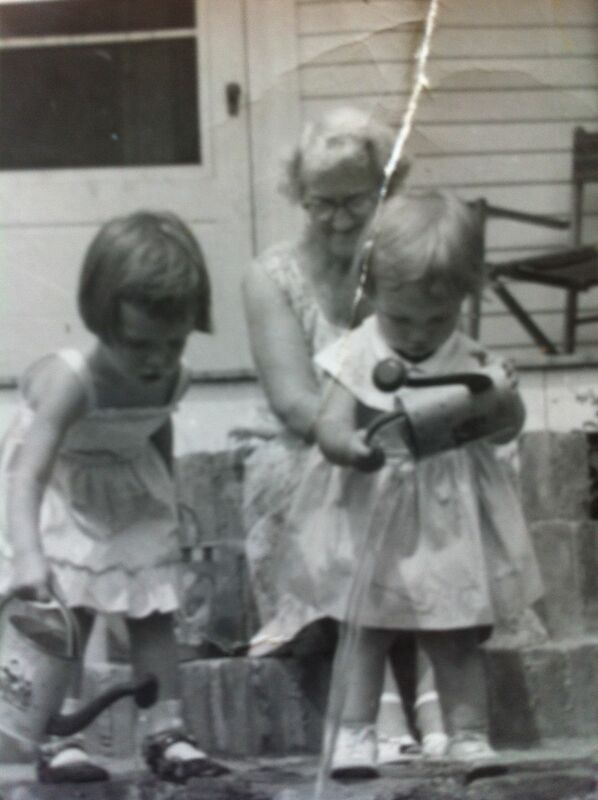 I was astonished at the much younger cousins who said they didn't have any photos of our grandparents and thanked me--so, I'd say digital certainly has advantages, as the cousins can download copies and print for themselves. It's funny how we take so many more pictures now too! There are photos of absolutely everything… sometimes, I think, people don't even see what's happening, because they are taking pictures of it. Karen, so fabulous to see you! And now I am regretting that we did not get a malice picture of the two of us . And, another sign of the times, I find I am almost using Facebook as a scrapbook. 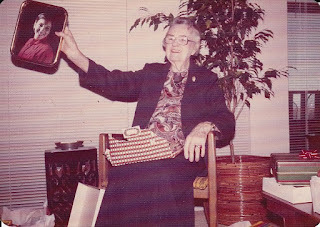 LOVE that photo of your grandmother, Deb - And for barbecue and tacos, Jerry would follow you anywhere. Old Photos. Oh golly I love them! Somehow, many years ago, I became the family photo archive person and aunties from both sides of the family were mailing me boxes of wonderful old black and white photos. Over a period of many years, I did manage to get them into albums. The the same thing happened with my high school class. I did manage to get hundreds of them scanned and put in a webpage. But there are more. Many albums more that I have not yet scanned, but I will. It's just finding the time, of course. I love having both the physical photos and the digital photos. But time's getting close now that I need to hand the albums of physical photos over to a younger member of the family. Not having children, it's a hard decision as to who will cherish and take good care of our history. I guess we're going to have to drag all our boxes of photos to Debs' house to follow Jerry's trail of BBQ! Debs, love the picture too. So Rick took the photo as you were going off to marry someone else?? Kaye, that's a tough choice. My dad turned boxes of stuff over to a cousin without consulting his four kids. We were a little mad, but on the other hand, my cousin is very devoted to cataloging family history so I think it was a good choice in the end. We have boxes of family photos of people that no one can identify. Some are beautiful studio portraits from the early 1900's. Too lovely to pitch, but no one wants them. I did a "quick and dirty" copy of old snapshots by taking photos of them with my iPad. The originals went to my aunt, who has lots of descendants, which we lack, but I have copies, which can be printed out with excellent results. Much faster than scanning and better than putting it off. All the photos are fantastic. My only "hard" photos are new ones from the past oh 25 years or so (does that still qualify as new?) I had wonderful old albums beginning with my great great grandparents in Germany, through my uncle's WWII cruise album (the last photos were of the ships in Pearl Harbor. His ship arrived soon after the attack and the boats were still smoking. Thankfully, my brother has that album), my parents' wedding album, my baby book and of course all the wonderful photos of my childhood right thorough to well, 1995 or so. When we were packing to leave Maine, I wanted to take a trip down memory lane, I discovered that the box with the albums had become nesting material for something that must have taken up residence in the basement at one time or another. Whatever it had been managed to shred or otherwise destroy everything, even those funky magnetic photo albums. Now most everything is on one computer or another with a mozy backup, but I do print the ones I want to have in "hard copy." What a sad story,Kait! Irreplaceable. My son had to do an autobiography project for the end of this year. And as I was helping him, I realized I stopped taking "photos" when he was around 8. Everything was digital. So I had to comb through the scads of digital pictures and have them printed. No, it wasn't the same as flipping through an album, but man we have a lot of pictures. Somehow, I never got around to the "lets pick the good ones and have them printed" part of the plan. That reminds me - he needs a photo album for this project. Do they still sell those? I have albums and boxes of pictures stuffed in a back closet in our den. It's hard to get open. I've always meant to go through and organize them. Yeah, like I have time for that. 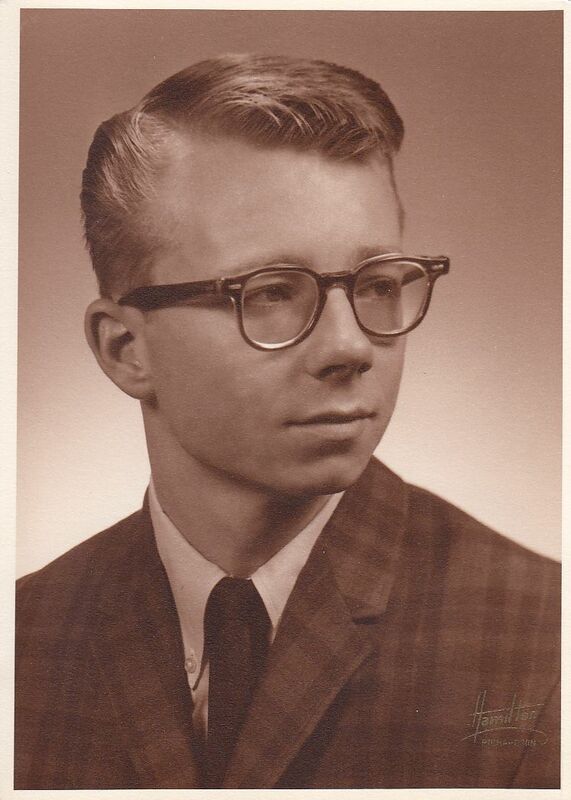 My sister has all the old photos from my dad's house - the family and school pictures and whatnot. She's probably a better keeper of them than I am at this point. The more I hear about Jerry, the more amazing he sounds. My spouse enjoys maintaining photo albums, so we are in pretty good shape as to the 15 years we've been together. Before that, she's got neatly labeled albums going back to her college years. Me? I've got a few snapshots here, a shoebox with photos mixed in with other ephemera there. When she had a significant birthday last year, my niece and sister-in-law helped pull together a slide show of Diane's neat albums. In a couple of years when I reach that particular milestone birthday, it will be a much shorter slide show, if there are enough to do one at all. Diane finds it a relaxing exercise to work on her photo albums. Can you even imagine? Like Jerry, she's a keeper. 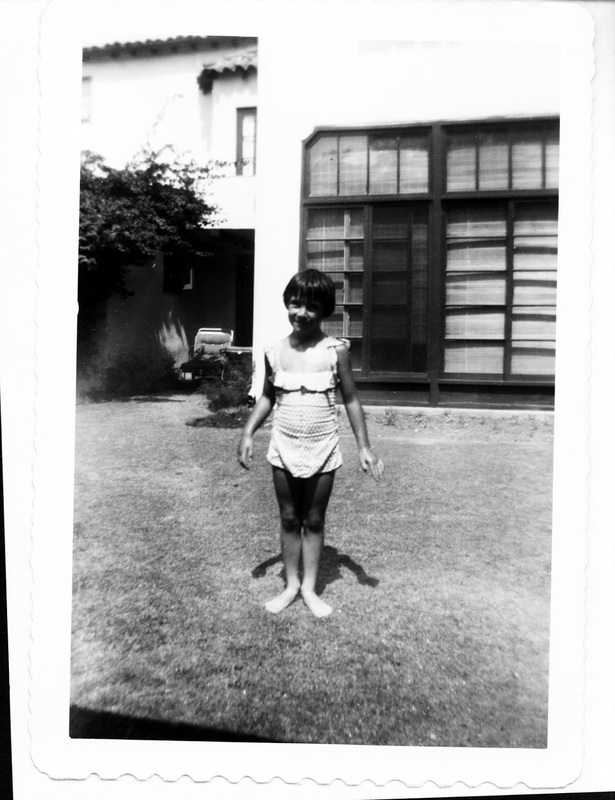 I am missing my childhood photo album. Just gone. Lucy, yes, indeed. It is a funny story I will tell you sometime. Hank, it's hard to find a balance, isn't it? Sometimes I deliberately don't take pictures, because I want to be in the moment and you can't when you are constantly snapping. And yes, we take so many pictures now that perhaps they loose some of their value. But would I give up my smart phone camera? No way!! In some ways it's very cool the way our lives have changed because we always have a camera with us. You get the unexpected shots, like the green lizards sunning on my porch, or the dogs or cats or babies doing something adorable. I missed this! But I wouldn't have been able to share photos; I don't have many. My mom is the keeper of the picture albums in our family. 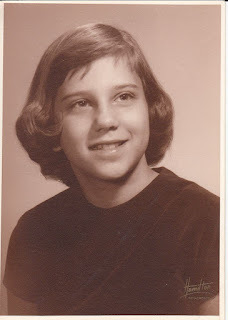 My sister Barbara is a bit of a photo fanatic - she has completely documented her family's history. Me, on the other hand...well, I once spent a month and a half in Italy and took nine photos during that time. That tells you all you need to know about me and photographs. I used to have a system but that was back when the system was write names and date on the back and put it in an album. But somehow the shoeboxes and envelopes and piles of negatives took over. And taking digital photos is fun but now there are so many and that seems overwhelming too. And now I'm remembering all those family sports and holiday VHS tapes I'm supposed to transfer to DVD or the cloud or somethng. When my husband's aunt passed away his cousins gave him an envelope of photos from when he was young, something his mother had never passed on. What a treat. I love to look at the old photos though. It's true that everybody looks so different now, but I think we all looked alike. I think I had Debs' haircut at one point, and Hank, I have a picture of my little sister Mary Jane and me at that same zoo on the same bear, also in our little dresses. We usually went to Brookfield Zoo so Lincoln Park seemed exotic when we went there. I love all of these childhood photos! Just so precious. And, Debs, the one of your grandmother is so special. There are some pictures that really stand out in the memory department. Unfortunately, I'm following in the tradition of my mother in having shoeboxes of photos to go through. Although, for my kids' photos, I made the leap to tubs. Hallie, we all need your husband's help! I think the last photo album I put together completely was before we had children. My daughter is so much more organized than I am about her family's photos. She told me that she was behind a year the other day and trying to catch up. I didn't think it was necessary to mention that I was 35 years behind. I have thought about using a company to digitalize my photos and videos, but even that seems like an overwhelming task. Grandma Cootie, you DO??? That is amazing.Amazing. What if..that bear was there for one day only....And we were there on the same day? I may have commented here before on this topic -- forgive any repetition -- but I have been swamped with family pictures (prints and slides) for the past year or so. I have been pretty ruthless in sorting -- discarding the majority. But I have had to go through them all because, wow, were there gems!! I took some slides to Walgreens and had them sent out for print. They were remarkable images. My own children and grandchildren's images, however, are a hodgepodge! And much harder to sort. Hank, that would have been beyond amazing! I keep my old photos. And my parents'. And my grandparents'. We''ve been a camera-toting family since Grandpa bought a Kodak Tourister in 1913. I still have a LOT of scanning to do, but I'm coming along. I often share old family photos on Facebook, and my cousins LOVE them.